Having read the various comments over the past few issues of The E-Sylum, I would like to chime in with some thoughts of my own. Other British papers reporting this news in December included, The Saint James Chronicle, Lloyd's Evening Post, The Scots Magazine and The Public Advertiser. A knowledgeable researcher I spoke to about this newspaper information questioned its accuracy since he said that CDs are generally about the size of a British crown, or 40 mm. When I questioned whether this diameter measurement applied to the brass CDs as well, there was a question in his mind. When he checked his records, he had weight measurements and not diameters. The Resolute Americana Collection owns four brass, two each of the Newman 1-A and 1-B varieties, respectively. They range in size between 36.9 and 37.8 mm, with an average diameter of 37.4 mm. When visually compared to a crown and half-crown from the 1740s, it is obvious the brass CDs fit between them on a size comparison. It seems realistic to assume that there were more circulating half-crowns than crowns in Continental America; therefore, referencing their size to a half-crown would appear to be reasonable. 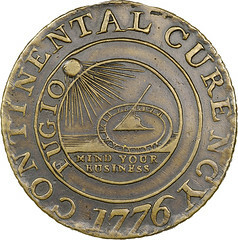 The size of the brass specimens might be of some importance because news stories reported speculation about a potential new copper coin from late June 1776 to early July 1776. During this period, the terms brass and copper were used interchangeably. 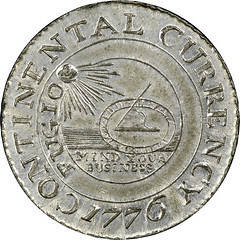 For example, The Pennsylvania Gazette, July 3, 1776, reporting news from New York of July 1 put forth the following: “We hear it proposed, that after three months, the currency of all copper coin, made of base metal, or wanting in weight, to be totally suppressed......And if it shall appear that there is not a sufficiency for common use, that it will be called in, and a new impression struck of Continental copper coin of a large size......”. 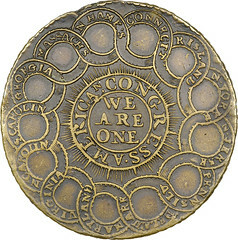 Thus, at this time there was a discussion occurring about potential Continental coinage. Benjamin Franklin owned this newspaper. To have a news report about a potential new copper coin in his newspaper the day before the Declaration of Independence is probably something we should consider as being important. The timing for this possible new coin would also relate well to that which was reported in the British newspapers in December. If the news account of the possible silver and copper coins appears meager, given its potential importance as a challenge to British sovereignty, I offer the following story as a comparison. The London Gazette, August 6 to August 10, 1776, provides among the first news accounts of the Declaration of Independence. This report was of such immense importance that it was carried in the seventh paragraph, second sentence, second column and it was about equivalent in length to the second half of the sentence from The London Chronicle, regarding the mint and coinage, or 33 words. He then finishes his sarcastic attack with one on “pewter dollars” in the final seven lines of the poem. I do not view this as an accident. By the way, the poem was published twice that month. Notice how he highlights “emissions of the paper coin” so the reference to “pewter dollars” should be viewed in the context of his attacks on the mounting paper money and paper coin. Jonathan Odell was the pre-eminent loyalist poet of the time and was well followed. He was a former physician in the British army, a clergyman, a gentleman and was a highly respected member of the community. His loyalty toward the king grew throughout the war. He and Joseph Stansbury, another leading poet, were both involved with aiding in the defection of General Benedict Arnold. Odell escaped to Canada while Arnold made it to England. Third, thank you to Mr. Tom Wetter for providing the letter and additional information about this wonderful book that you can order on Amazon, “1700s in America,” first published in 1784, which Bob Keathley brought to light by having his rare copy translated from the original German. I have now given away nearly 300 copies to high-school students and adults since I view it as one of the best and earliest descriptions of Revolutionary America. The American Revolution was a big news item in Germany and imagery was used to help better convey the importance and idealism of the Revolution. The CD imaged in the book is a Newman 2-C variety, which means “Curency” has now been corrected to read “Currency” and Massachusetts is still listed before New Hampshire. 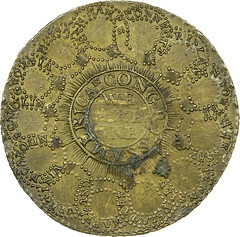 The order of these two colonies was reversed, corrected, with the Newman 3-D variety. In my opinion, the timing of the book publishing would not have allowed the 2-C variety to have been coined and then copied for publication. The timeframe would have been too tight; therefore, it already had to be in existence. If this coin were meant for sale in America or Europe, why worry about the spelling? Most people would not know the difference. There are seven different Newman die varieties. If this was intended to be a medal to be sold cheaply, why go through all this trouble? Additionally, because of the various die rotations, this indicates a die re-alignment and change had to occur several times. I recently had my pewter 1-A, a Heritage Auction's discovery in 2015, cracked out so as to investigate its edge design. I discovered that it has a plain edge and its die rotation is identical to that of the brass 1-A that has an ornamental edge. This is an indication that a single set of dies could be used to strike different denominations that are differentiated by the metal utilized. This occurred again with the 1-C variety but this time the difference is between a plain edge pewter versus a silver with edge ornamentation. 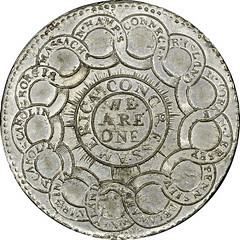 There are several examples of single die designs with identical planchet size that used metal, silver and copper, to differentiate between denominations. 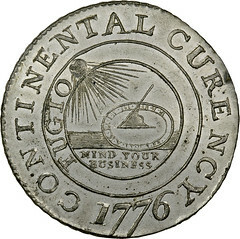 Examples include the 1785 Inimica Tyannis America, 1785 Immune Columbia and the 1792 Getz pattern coins. I also think a comment should be included regarding the crudeness of pewter dollar coinage and engraving. When one compares a pewter dollar to coins and medals that were minted in Europe around that time, the differences are obvious. One only has to view a Betts-610, Treaty of Paris medal, to see the difference in quality, though a plain edge was used for both the silver and pewter varieties. The pewter Betts-614, Treaty of Paris, also suffers by comparison. Though it looks and feels like a pewter Continental Dollar, there are a couple of subtle design differences. 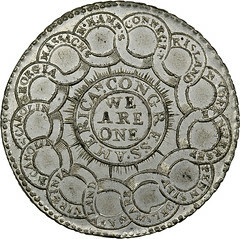 The edge design is different from that of the pewter dollars. Upon closer inspection, the reverse is differentiated in two ways. First, there are three dots between the “N” and “C” of American and Congress and second, there is a star between Congress and America. Finally, it uses the earlier reverse design, as it appeared on the 1-C and 2-C varieties. Lastly, Bob Leonard submitted notes on Catherine Eagleton's 2015 Numismatic Chronicle article, “Collecting America: Sarah Sophia Banks and the ‘Continental Dollar’ of 1776.” There is a hand written notation in the Sarah Sophia Banks catalogue (1815) that states, “Continental Dollar. 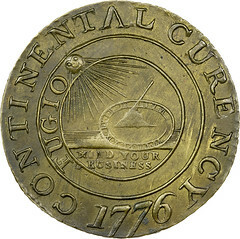 1776. never current, struck on speculation in Europe, for sale in America.” This comment was above an advertisement offering them for sale at sixpence each. First, there is no indication from what publication the ad came from or its date. Second, no one has, including myself, found a copy of the ad in an intact publication, which means we do not have a confirmation of its authenticity. For an excellent critique of Eagleton's article, I refer you to The E-Sylum, June 14, 2015, volume 18, to read, “A few Notes on Catherin Eagleton's Numismatic Chronicle Article on the Continental Dollar,” by David F. Fanning. 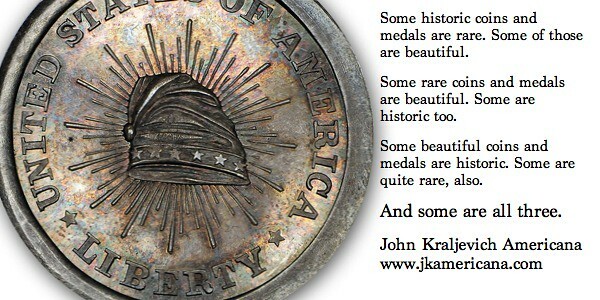 In summary, I believe variations in design, metal type, crudeness, newspaper coinage references, Jonathan Odell's poems and the volume, “1700s in America,” indicate these mysterious coins are something more than what we currently understand them to be; however, my research convinces me that they are from the period as minted. I would like to offer one last observation. The Continental Dollars are the coins that capture a student's imagination among all the rare coins I bring for a classroom presentation. Today, when it seems as though many are highlighting our differences, the simple message conveyed on the Continental Dollar's reverse, “WE ARE ONE,” encapsulates the goal and spirit of our emerging country.